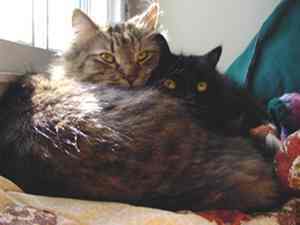 Stephanie and Ricky write, "Gatsby (left) and Seuss (right) are brother and sister cats from the same litter. 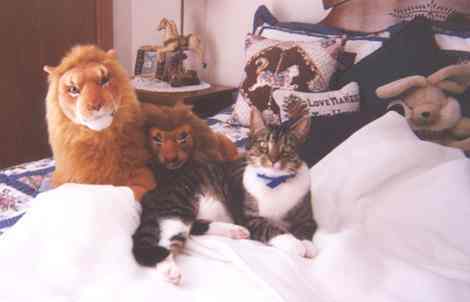 They were adopted from Kitty Angels in September of 1998 when they were about three months old. They were semi-feral when adopted, but they've come a mighty long way. Gatsby is the mushiest of mushballs and he loves to tackle feet, lick noses, and be scooped up and danced around. Seuss can be a bit neurotic, but she's a warm-hearted, affectionate girl with a mighty purr. They recently made the move with us to Nyack and love to sit on our glassed-in porch and look out over the Hudson." 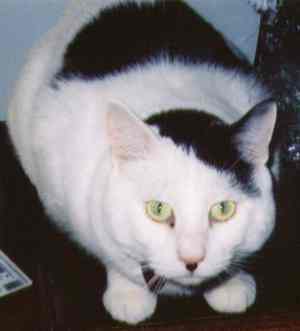 Audrey writes, "This is a picture of Lewis (lou lou) adopted in July of 2000… He is by far the most lovey cat! He was found with his neck slashed when he was a baby. I wouldn't trade him for the world." 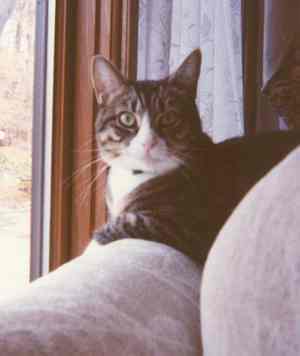 Joan writes, "I thought you might enjoy seeing some pictures of Max (above) and Sonya (left), adopted in August 2002. Max is shown with his "pals", the stuffed lions, and Sonya is in one of her favorite places, looking out the living room window. I think Max and Sonya have adjusted well to their new environment. I enjoy having them around and part of my life."